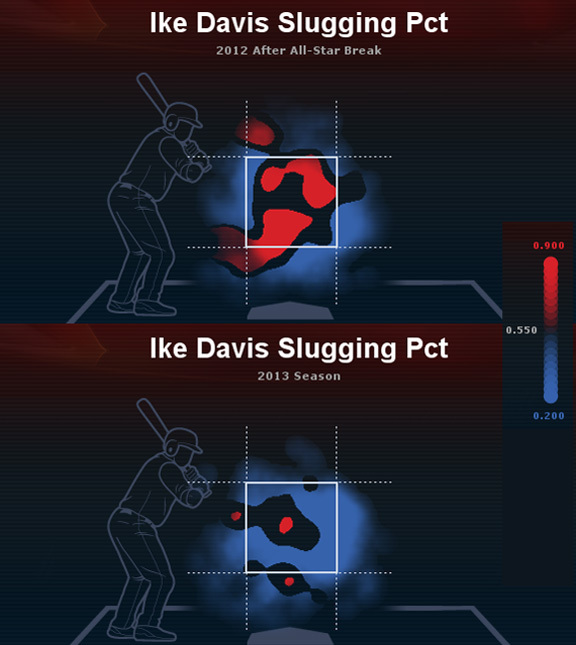 What does Ike Davis need to work on during his time in Las Vegas? If the images above don't tell you enough, here are a few more stats about Davis' performance this season that would indicate some areas in which improvement will be a necessity. First and foremost, Davis needs to get back to being a power hitter. His .258 slugging percentage ranked worst in the majors among batting-title qualifiers, and his isolated power (slugging percentage factoring out singles) was .097, or almost identical to 5-foot-5 Astros second baseman Jose Altuve. Our video review showed that Davis had a "hard-hit ball" in only 9.6 percent of his at-bats. That’s the fifth-worst rate in the majors and a percentage barely better than Marlins outfielder Juan Pierre. When Davis actually hit the ball, his hard-hit rate was 15 percent, 12th-worst in the majors and well below the average rate among batting title qualifiers, 22.5 percent. In terms of pitch locations and pitch types, Davis cratered in every possible way. Our pitch-performance data break down pitches into six areas (upper-third, middle-third, lower-third height-wise, and inner-third, middle-third and outer-third width-wise). Davis' slugging percentage dropped at least 240 points in every pitch location from the second half of 2012 to his current numbers in 2013. It dropped 238 points against fastballs, cutters and sinkers, and dipped 344 points (to .134) against off-speed pitches. Pitchers realized that Davis was a sucker for an off-speed pitch, throwing them to him over and over again. Davis ended an at-bat with an out against an off-speed pitch 74 times, the most of anyone on the Mets. Davis couldn't hit pitches out of the strike zone, but he couldn't hit them when they were in the strike zone either, his slugging percentage against those plummeting from .634 (2012 second half) to .333 (2013). And the problems Davis was having are worse in some areas than they were when Davis was at his worst last season. Davis is 9-for-100 in two-strike counts in 2013. That’s nearly 50 points below what he hit in the first half of 2012, when he dealt with his massive struggles that season. Here’s the bottom line: We spent 30 minutes going through our tools and could not find any area in which Davis was even maintaining what he did after the break. We could probably have summed it up with 30 seconds of searching. In short, Davis is a man in need of hitting help in every possible way.